This entry was posted in Heat Pump, Physics, punktwissen, Science and Technology and tagged Electrical Engineering, Electricity, Electricity Market, Engineering, Geek, Innovation, Physics in Everyday Life, Power Grid by elkement. Bookmark the permalink. Ignoring cooking and flint knapping, I would put writing as the crucial innovation/invention. Up to that point objective knowledge was limited by the capacity of human memory, handed on from generation to generation through oral tradition. With writing, virtually unlimited expansion of objective knowledge became possible. Putting down the ‘engineer’s spectacles’ I used when writing this post I fully agree with you. In my most recent time-out from social media I revisited lots of books on the history of technology, in particular Nicholas Carr’s tech-critical review of the way the internet has changed the way we think. Carr also states that writing – in particular the availability of books for common people after the printing press had been invented – as a singular innovation that changed the way we think and process information. Ironically, ‘the internet’, the information snippets shared on social media, and our skimming instead of deep reading seems to erode these profound changes. Hi Elke, as far as I remember you can fix in a Power grid either the frequency or the voltage – while in the old days the western european countries were sticking to the 50Hz but have 230V+- 10%, in Eastern Europe it was 220V and 48-52Hz. So indeed, not for each PC switched on or off a Power plant has to be triggered. But the smaller your network (on an island, a small village in the mountains) the more critical is the load or change in the load (8am, the ski lift is started and the lights go down). For a while machines were controlled by the network frequency, so the western model had advantages, today, electronics is so advanced, that big loads are controled by a microcontroller anyway. Todays challenge – how to restart your power grid after a crash without getting unstable ! Hi Claus – thanks for your comment! Yes, that’s right – my explanation of the control mechanism was rather sloppy! As far as I know voltage has to be controlled together with wattless power (…phase angle between the magnetic fields in the stator and the rotating part of the generator…angle changes with load… resulting voltage changes with angle…) but this should not be an issue for nearly purely resistive power consumed by home owners (?) Effective power / frequency is controlled by the turbine, reactive power / voltage is controlled by the excitation of the generator. Today the requirements for AC power are defined a European standard for power quality which demands that 95% of the 10 minute averages of the voltage must not deviate by more than 10% – I don’t know which countries hold their utilities accountable to the standard. China allows for larger variations in frequency which requires different inverters for Chinese wind turbines. And, this is calculated to help me sleep better? Given the inherently precarious nature of the system (too many variables changing in potentially stochastic ways) your last statement about self-sufficiency is clear. I have also looked at what Maurice had to say and agree. The best solution then, for the individual, would be to blend the ideas of these great minds … individuals need to be more self-sufficient, less reliant, and one would hope for a departure from fossil-fuel-based electrical generation. Austria is lucky to have such plentiful hydroelectric resources. What would you suggest for the rest of us? Maurice was right when he said, “Thanks to oil we’ve polluted the place, wrecked much of our groundwater, killed millions of non-combatants and made evil people rich.” What do you suggest Elke? It seems that all non-petroleum-based technologies fail at the largest of scales .. neither wind nor solar nor geothermal can support populations equivalent to those now supported by the petroleum-based-generation systems. So, it seems to me that you are even more correct than perhaps you were aware. We have to rely on individual self-sufficiency. Each of us needs a wind-generator our out back door. Perhaps this is going back-in-time … but would that be all that bad? I advocate exactly that type of self-sufficiency you are referring to: Supply reasonably small units with their island-style renewable resources. Probably one generator per home is too fine-grained because not any individual would prefer to be accountable for maintenance of all the machinery. But making small villages self-sufficient should make sense also from an economic perspective (Costs of maintenance). In particular this is true for anything biomass-based as transport is too expensive. For larger cities we need a “smart” approach though. I have found a stunning example recently: There is a small region in Austria that had operated in off-grid “island” mode until the 1970s (!) until they had been connected to the grid. Today they are happy about having an infrastructure that is still built to support island-like operations – and they plan for making their region self-suffiencient again. Going back in time would not be that bad in this respect. But the first step should be the reduction of energy consumption. Checking statistics for consumption and CO2 emissions I feel that ‘mobility’ is the real problem – fuel consumptions seems to be hardest to reduce. I believe tons of fuel and related CO2 could be avoided by changing the way the majority of people works (is forced to work) and the way many people spend their vacations. I have never understood why it is the standard thing to do to travel 100s of kilometers to show up at a meeting that lasts for two hours. It is a matter of corporate culture as the technology for remote work is available. During the economic crisis many companies were much more travel-cost aware and promoted working “online”. The vacation thing is trickier – because spending your vacation at the other side of the globe is still considered an indicator of social status … though I feel this is gradually changing. After reading your blog for a while now this post does not surprise me, and I was looking forward to one day encountering your thoughts in a post. 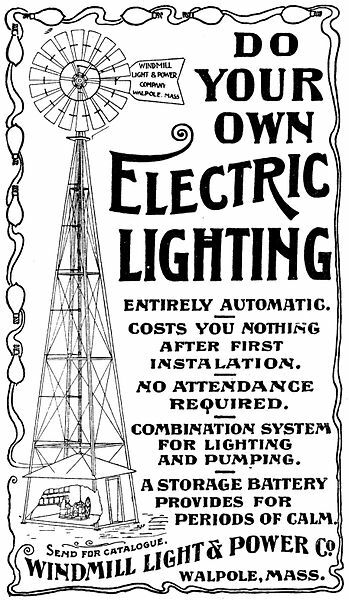 I agree with you in the end, ‘do your own electric lighting.’ (I am very curious to see how this fourth element, the DIY producers, will impact the grid as they add their own electrical contribution… but of course, this is hoping the contribution is significant enough to be of consequence!) Great post. Yes, I am also interested in the impact of DIY producers, too – in part the smart grid is built in order to support them. But there are some real challenges due to the volatility of wind and solar power. In Germany distribution system operators are already allowed to disconnect DIY solar power plants from the grid in order to maintain stability and keep the voltage within an allowed range. Currently customers are motivated to go for self-sufficiency instead of having electricity fed into the grid – even the utilities offer turn-key solutions such as solar panels + batteries + energy management systems. When we were considering alternative energies to use on the farm we often wondered how we would store the unused energy. Of course, batteries were an option, but we needed many to make ourselves fully independent of an external power supply. It would have been ideal to sell the excess energy back to a service, and bank that power as credits against our future consumption. This wasn’t an option at the time, probably due to the logistical problems you’ve explained. Even though the time has passed and we no longer have need of a storage system (due to having moved) it was exciting to first read about the way you were storing energy and using it with heat pumps. Thanks, Michelle! You remind me that I should post an update about the performance of the system after nearly a full year of operation – including the summer season when our storage tank had been used for cooling. As a tech head, electrical / electronic engineer and author, I looooved this article. Great viewpoint. Thanks – I am honored! Else we’d be rather different. Now I will go as far as to say that I remain skeptical that the decision to go with petroleum as a preferred energy source was, in the end, something that was good for us all. Thanks to oil we’ve polluted the place, wrecked much of our groundwater, killed millions of non-combatants and made evil people rich. Oh, and made other excellent sources less important than they should be. Now, of course I am bound to like your choice. After all, without electricity I would have no toys–no toys at all–to play with. No instruments by which to pursue physics. No decent communications technology. What we really need, though, is to stop energizing it through coal and oil. I fully agree with you, Maurice! I am saying this as an inhabitant of a country which is rich in hydropower – so it is ‘easy’ for me to advocate renewable energies. Germany, for example, is more dependent on coal. However, the ‘smartness’ of the grid to be developed should compensate for that and distribute wind power generated in the north of Europe and solar energy harvested in the south of Europe. As I said, I am just worried by the side-effects introduced by complexity – in particular by (mis)using that smartness for gambling or by considering home owners energy storages (such as electric vehicles or heat dumps) just as a buffer to be used in times when the costs of electricity are high. I would rather use my personal storage for myself only and renounce of the money to be earned by buying electricity only when it is ‘cheap’.